Ballymena United’s youth team are assured of at least a fourth place finish in Section A of the NIFL Youth League after a 4-1 drubbing of Glentoran on Saturday. Against the same team who had knocked them out of the cup two weeks earlier, United made the perfect start as inside the opening four minutes, Woods played a 60 yard pass to Weir whose quick back heeled pass played in Sloan who made no mistake from 15 yards. Ballymena were running the Glens ragged and after good midfield interchange between Watson, Bonnes and Nixon resulted in McNeill spinning off his man and slotting it past the keeper on the 16th minute. 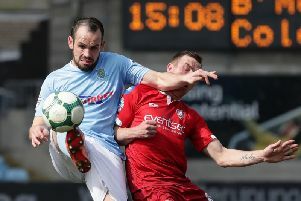 The Sky Blues’ slick pass and move combinations were a pleasure to watch and it was McNeill again, played in by Nixon, who got his second of the game and Ballymena’s third on the 28th minute. Nixon completed a memorable half with Ballymena’s fourth goal on 40 minutes. After half time Ballymena took their foot off the gas and were happy to play possession football. Ballymena keeper Darren Corry pulled off some fantastic saves when he was called upon. A lapse of concentration on the 71st min allowed Glentoran to get a consolation goal but it didn’t detract from an impressive Ballymena display. The youth team are at home to Dungannon on the Showgrounds 3G this Saturday (12 noon).